Spring: March I'll be performing Fred Hersch's Leaves Of Grass with the phenomenal Kurt Elling at Berkelee Performing Arts Center and then in the Durham, Wilmington and Virginia later in April. See the calendar for more details! DECEMBER 7TH - The Subject Tonight Is Love nominated for a GRAMMY AWARD for Best Jazz Vocal CD!!! 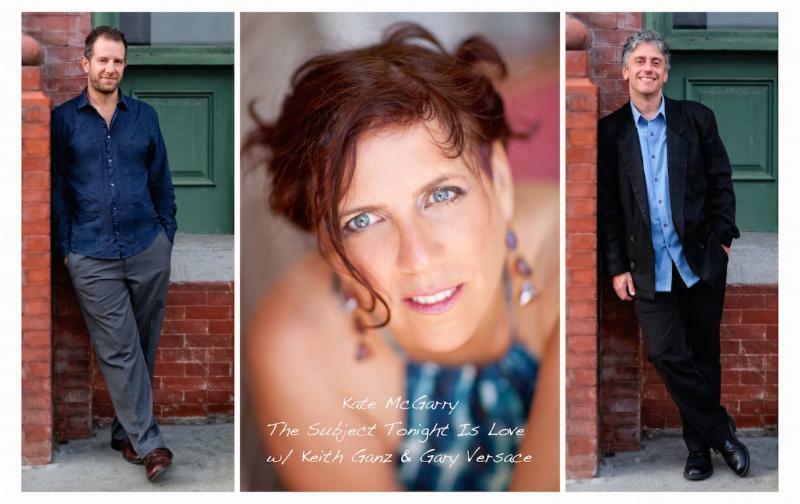 Kate McGarry, Keith Ganz and Gary Versace are all going to Los Angeles February 10th to participate in the Grammy Awards!! We are happy, excited and humbled that our Pledge Music fan funded project made it to the hearts of jazz fans and The National Academy of Recording Arts and Sciences. Many thanks friends and music lovers! Fall 2018: Look for us up in NYC this fall at Cornelia St Cafe Sept 27th, Mezzrow Oct 18th, a Joni Mitchell Tribute at NJPAC on Nov 11th with Luciana Souza, & Jo Lawry! In December we're part of Duke Performances' Historic Jazz Vocal Festival - In The Jazz Tradition: Dec 2-9th featuring Nnenna Freelon, Cecile McLorin Salvant, Catherine Russell, Jazzmeia Horn, Nellie McKay, Rene Marie and Kate McGarry Quartet! Over the course of a dozen conceptually–linked songs, the collective group of McGarry, Keith Ganz, and Gary Versace investigate the concept of love in its many forms. The formidable talents of these Grammy nominated musicians are in full bloom on this ambitious outing. Ganz shines on nylon, steel, electric and bass guitars while Versace moves masterfully between piano, electric keyboard, organ and accordion. Together they create a richly nuanced sonic canvas. McGarry's voice rings true throughout, painting pictures that penetrate and illuminate the human journey. NOV/DEC 2017 Cape Cod here we come! Who ever said 'You can't go home" was wrong wrong wrong.. We'll celebrate the holidays with The Cape Symphony Dec 1st, 2nd and 3rd Holiday on the Cape under the direction of Maestro Jung-Ho Pak. I've got a gorgeous new arrangement of Some Children See him by young composer Alex Berko. Keith and I will duet on Joni's classic River, there will be harmonies with two other wonderful Cape talents. See you there! Later in the month (December 15th) my dear brother Neil McGarry will be in Durham with his award winning one man show A Christmas Carol at Sharp Nine Gallery. The following night Dec 16th Keith and I will perform at Sharp Nine Gallery with special guest Dave Finucane Let It Snow! NOV 2017 WELCOME TO THE DURHAM ARTS MARKET - Kate McGarry & the Tough Get Growing Ensemble will be showcasing at 8:25pm Monday Nov 6th at the Historic Carolina Theater in Durham. Presenters can find us at Booth #150 in the exhibition hall. We look forward to meeting you all! Oct 2017 In preparation for our February album release of The Subject Tonight Is Love, Keith Ganz, Gary Versace and I are working with Ann Braithwaite Promotions and Marie Le Claire Management. Find their info on our contacts page. What a busy month it's been - I started out at Western Michigan University with the MOSS Residency, then straight to Cologne Germany, and now I'm back putting the finishing on our upcoming album The Subject Tonight Is Love. It's getting mastered as I type! After a quick trip to NYC Keith Ganz, Gary Versace and I will hit the road for a rare visit to see our friends on the West Coast - If you can see Hawaii from your house, take a look-see at the calendar page and come to one of our gigs! August 2017 I'm writing under the sunny NOT HUMID skies of Palo Alto (take that soggy Durham!) during a break at Stanford Jazz Camp with the fablous news that we just hit 76% of our PledgeMusic Campaign goal! SO happy to know that listeners want this music and are pre-ordering to help us be able to produce and share it! MANY THANKS FRIENDS and please do keep passing the word and pre-ordering! June IS Busting out all over! - I've been in the studio with bandmates Keith Ganz and Gary Versace and we've got a beautiful project in the works that will be released in tiime for Valentine's Day. It's called The Subject Tonight Is Love. Shortly we'll be posting our PLEDGE MUSIC CAMPAIGN offering our fans and music lovers the chance to pre-order the new CD (so we can make it!) We'll have great perks - live concerts, lessons, my homemade ghee and body butter - for everyone who wants to join us on the journey to getting this music made and out into the world. Please check back to this page and on our Facebook page and we'll have the link up sooooooon! Thank you in advance for your support! PS I'm heading to SF Jazz Festival for a concert with Fred Hersch and Julian Lage at the historic Herbst Theater Friday, June 9th. Come on Left Coasters! MARCH MADNESS? No way! Manhattan School of Music's future jazz stars and scholars beckon - Auditions for Fall 2017 Graduate Vocal Jazz Arts Program are tomorrow! Good Luck everyone. I'm also looking forward to meeting the new Department Head of Manhattan School's Jazz Arts Program - Stefon Harris! Later this month Keith and I will (belatedly) celebrate St Patrick's Day with a concert at The Irish Art's Center in Manhattan with Christine Tobin and Ingrid Jenson. March 23rd - 8pm. 2016 DOWNBEAT Rising Female Vocalist Award!! I'm honored to receive this 1st place designation from the top jazz critics in the land! Congrats to all the wonderful vocalists listed here! Hey now - lots on the spring time to-do list, including going with Keith and The Tough Get Growing Ensemble to NJPAC to hang out with Jonathan Schwartz and Cyrille Aimee on Satu MAY 7th 7pm. Then heading back a week later to meet up with Fred Hersch for his 10th Duo Invitational Series at Jazz Standard MAY 14th 7:30 & 9:30. Later in June we'll be on Cape Cod for shows at The Spire and Woodshole Arts Center. Below here's a little video taken at Newport Jazz Fest last August. It's currently 11pm. Departure time is 4am for the flight to Toronto. Oh, yeah baby, bring it on! In other news, journalist Peter Hum of the Ottawa Citizen has written a lovely piece about my work just in time for our first visit there Thank you Peter! Take a look see. If you have any pals up in the Northeast - Toronto, Ottawa and Montreal - please send em our way this weekend. Check out the calendar page for deets. Many Thanks! 2016!!! - started off beautifully with a memorable set at JEN Conference and an epic snow storm resulting in splendid sledding opportunities. February and March we'll go for the first time to Maryland, Texas, and Toronto, Ottawa and Montreal - see the gigs page for more info and hope to see you somewhere soon! Other news - A long awaited (by me!) recording is in the works with Fred Hersch!! and another with Keith Ganz and the The Tough Get Growing Ensemble! Check back for updates... LOOKING AHEAD TO NJ PAC MAY 7th with JONATHAN SCHWARTZ AND CYRILLE AIMEE!!! December is a cumin in….We'll be in NYC for Jonathan Schwartz's 45th Radio Christmas Special. Sunday Dec 20th 12 -4pm…Don't miss it! Tune into WNYC.ORG or log onto the Jonathan Channel. Keith and I will also hit our beloved 55 Bar, 55 Christopher St NYC Friday Dec 18th 6-9pm for old time's sake…we miss you 55! Beautiful mini tour to Atlanta's hottest new jazz club, The Velvet Note and Asheville's Biltmore Lake Country Club. Tomorrow we head up to NYC to premiere our new music at National Sawdust. Here's a sneak preview of our arrangement of Barrytown with Onome Ekeh's 'arresting' visuals... literally. The fall is heating up now... check out this stunning video Onome Ekeh just made for our upcoming premiere at National Sawdust NOV 19th The Crack: What To Wear In The Dark - there will be birds! FALL 2015 - Jo Lawry and Will Vinson started the season off right with a visit to Durham and our first performance of KEY PARTY at Sharp 9 Gallery. There was LIFT OFF and all involved were happy with the results - look for more KEY PARTY in 2016. We are ramping up for our November tour of The Crack: What To Wear In The Dark featuring The Tough Get Growing Ensemble. Look to our touring page for more info and come hang with us if you are in NYC, Atlanta or Asheville!